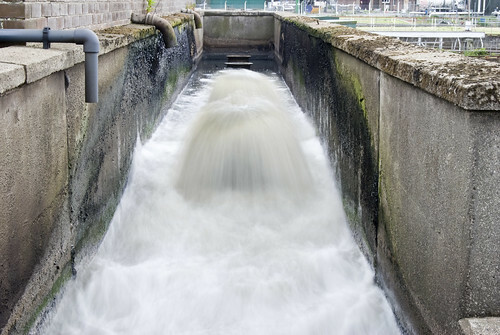 Getting more electricity from sewage: just add gold? By gilding microbial fuel cells with gold nanomaterials, researchers are discovering ways to make more electricity from wastewater (and clean the water while they're at it). Sounds pricey, but maybe they're on to something? Gold is helping researchers from Oregon State University improve the generation of electricity from microbes. Potentially, the nanotech might prove useful in the realms of water treatment and renewable energy. Bacteria placed within the anode chamber of a fuel cell (a multi-anode microbial electrolysis cell, MEC) multiply to form a biofilm. As they grow, the bacteria, such as Shewanella oneidensis, release electrons. Publishing their work recently in Biosensors and Bioelectronics, researchers from Oregon State University say gold nano-coatings on the anodes can help produce 20 more times the amount of electricity than graphite anodes without the coating. Palladium coatings also helped, but not significantly. They are also looking at how cheaper coatings such as iron might effect electrical output with certain kinds of bacteria. So far, the technology only works in the lab, but the hope is that MECs might one day help treat (as well as possibly desalinate) water while they generate power. Energy self-sufficient sewage plants would prove useful in remote areas that lack the power supplies needed to adequately ldeal with water contamination issues. This is an important step toward our goal. We still need some improvements in design of the cathode chamber, and a better understanding of the interaction between different microbial species. But the new approach is clearly producing more electricity.